ENTERTAINMENT at it's finest! I haven't seen a show this good in literally decades! This show got everything just right. It is funny, well cast and well acted. You leave the theater so much happier than when you went in. To my pleasant surprise, Daniel Radcliffe is an terrific actor. He holds his own with John Laroquette easily. If you can only see one show, and want a great time - this could be it. 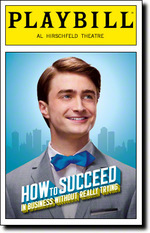 How to Succeed was a light hearted traditional Broadway musical. The story was pretty funny and the comedy was well delivered. The dancing, costumes, and sets were all top quality. The music wasn't very memorable and the story was very dated. All the women were portrayed as dumb or aspiring to be good wives. If you go into the show keeping in mind the time in which it was written it can be quite entertaining.